BD 140 is a PNP transistor and it conducts only when its base is grounded. 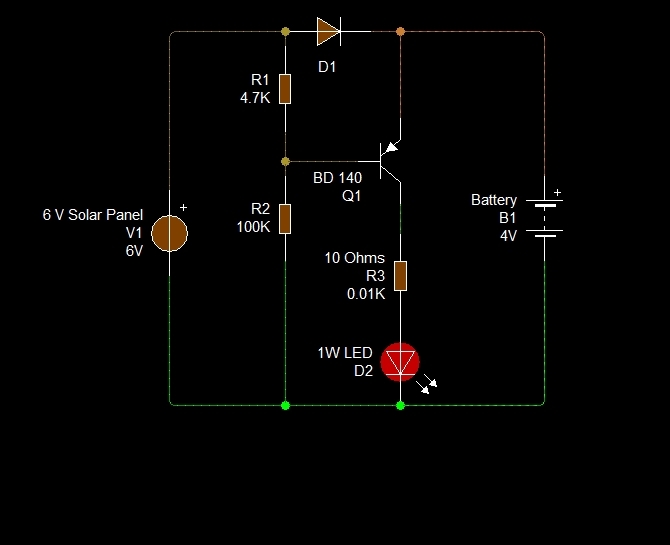 In the circuit, BD 140 acts as a switch to turn off /on LED based on the presence or absence of voltage from the Solar panel. During day time, solar panel generates around 8 volts with 500 mA current. Diode D1 forward biases and battery charges. At the same time, the positive voltage from the solar panel keeps the base of BD 140 high through the 4.7K resistor. As a result transistor remains off keeping LED also off. In the evening, voltage from solar panel drops. D1 reverse biases and the base of transistor turns low through R2. It conducts and current flows from the battery to light LED. In the morning, condition reverses and LED turns off.